Whether you like them straight out of the bag, roasted to a golden brown exterior with a molten center, or in fluff form, who doesn’t like marshmallows? We definitely like them! Since the launch of the M Developer Preview at Google I/O in May, we’ve enjoyed all of your participation and feedback. Today with the final Developer Preview update, we’re introducing the official Android 6.0 SDK and opening Google Play for publishing your apps that target the new API level 23 in Android Marshmallow. The final Android 6.0 SDK is now available to download via the SDK Manager in Android Studio. With the Android 6.0 SDK you have access to the final Android APIs and the latest build tools so that you can target API 23. Once you have downloaded the Android 6.0 SDK into Android Studio, update your app project compileSdkVersion to 23 and you are ready to test your app with the new platform. You can also update your app to targetSdkVersion to 23 test out API 23 specific features like auto-backup and app permissions. Along with the Android 6.0 SDK, we also updated the Android Support Library to v23. The new Android Support library makes it easier to integrate many of the new platform APIs, such as permissions and fingerprint support, in a backwards-compatible manner. This release contains a number of new support libraries including: customtabs, percent, recommendation, preference-v7, preference-v14, and preference-leanback-v17. 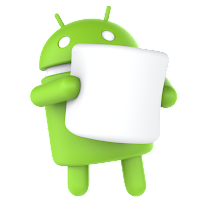 Along with the new platform features like fingerprint support and Doze power saving mode, Android Marshmallow features a new permissions model that streamlines the app install and update process. To give users this flexibility and to make sure your app behaves as expected when an Android Marshmallow user disables a specific permission, it’s important that you update your app to target API 23, and test the app thoroughly with Android Marshmallow users. Google Play is now ready to accept your API 23 apps via the Google Play Developer Console on all release channels (Alpha, Beta & Production). At the consumer launch this fall, the Google Play store will also be updated so that the app install and update process supports the new permissions model for apps using API 23.